“Orbital Floor Fractures: Diagnosis and Treatment” December 2004 Grand rounds for the department of oral and maxillofacial surgery St. Luke’s-Roosevelt Hospital Center. New York, NY. Khosh MM,et al: Surgical Management of Nasal Valve Obstruction: Experience in 53 Consecutive Patients. Archives of Facial Plastic Surgery. 2004 May-June;6(3):167-71. Horn C and Khosh MM: Closure of Auricular Cartilage Harvest Site with Absorbable Quilting Sutures: A novel technique. Archives of Facial Plastic Surgery. 2004 May-Jun;6(3):202-3. Khosh MM, Larrabee WF, Smoller B: Safety and Efficacy of High Fluence CO2 Laser Resurfacing. Journal of Cutaneous Laser Therapy :37-41, 1999. Khosh MM, Hilger P, Nishioka G, and Larrabee WF: Modification of the Mustarde Otoplasty Technique Using Temporary Contouring Sutures. Plastic and Reconstructive Surgery. 1997 Nov;100(6):1585-6. Khosh MM, Keen MS: Botulinum Toxin A Injection for Forehead Rhytids. Operative Techniques in Otolaryngology-Head & Neck Surgery, 1995 6:324-326. Keen MS and Khosh MM: Botulinum Toxin Type A Injection For Hyperfunctional Facial Lines. Laryngoscope. 1995 Oct;105(10):1134-7. Krespi YP, Khosh MM, and Blitzer A: Transnasal Endoscopic Laser Surgery For The Treatment of Benign Nasopharyngeal Lesions. Operative Techniques in Otolaryngology-Head and Neck Surgery. 1994 5:267-271. Krespi YP, Keidar A, Khosh MM, Pearlman SJ, and Zammit G: The Efficacy of Laser Assisted Uvula Palatoplasty in The Management of Obstructive Sleep Apnea and Upper Airway Resistance Syndrome. Operative Techniques in Otolaryngology-Head and Neck Surgery. 1994 5:235-244. Khosh MM, Lebovics RS: Upper Airway Obstruction. In Critical Care Medicine-Principles in Diagnosis and Management in the Adult. Second Edition. Parrillo JE, Dellinger RP (ed) Mosby Saint Louis, MO. 2001. Pp 808-825. Khosh MM: Facial Implant Gore-Tex. In Management of Facial Lines and Wrinkles. Blitzer A, Binder WJ, Boyd B, Carruthers A (eds) Lippincott Williams & Wilkins, Philadelphia, PA. 1999 Pp 135-144. Khosh MM, Hilger P, Nishioka G, and Larrabee WF: Modification of the Mustarde Otoplasty Technique Using Temporary Contouring Sutures. In 1999 Yearbook of Plastic, Reconstructive and Aesthetic Surgery. Miller SH (ed) Mosby Inc, St. Louis, MO. Pp 52-54. 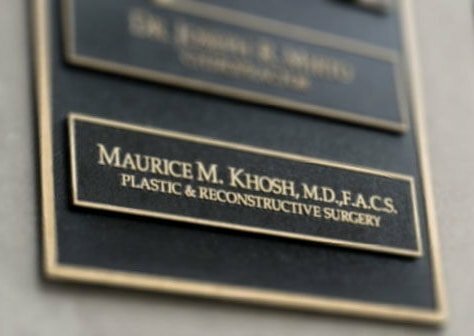 Khosh MM, Murakami CS: Local Anesthesia in Facial Plastic Surgery. In Otolaryngology-Head and Neck Surgery. Third edition, Cummings C, et al. (eds.) J. B. Lippincott Co. Philadelphia, PA. 1998. Pp 560-571. Khosh MM, Larrabee WF: The Biomechanics of Skin. In Surgical Techniques for Cutaneous Scar Revision. Harhap M (ed.) Marcel Dekker Inc. New York, NY. 1999. Pp 15-24. Krespi YP, Khosh MM: Laser-Assisted Serial Tonsillectomy, In Office-Based Surgery in Otolaryngology. Blitzer A, Pillsbury HC, Jahn A, Binder W (eds.) Thieme, New York, NY. 1998. Pp 429-432. Krespi YP, Khosh MM: The efficacy of Laser Assisted Uvulopalatoplasty in the Management of Obstructive Sleep Apnea, In Office Based Surgery of The Head and Neck. Krespi YP (ed.) Lippincott-Raven Publishers. Philadelphia, PA. 1998. pp 129-140. Khosh MM, Krespi YP: Laser Assisted Tonsil Ablation, In Office Based Surgery of The Head and Neck. Krespi YP (ed.) Lippincott-Raven Publishers. Philadelphia, PA. 1998. pp 141-146. Khosh MM, Nishioka G, Larrabee WF: Cutaneous Laser Resurfacing, In Office Based Surgery of The Head and Neck. Krespi YP (ed.) Lippincott-Raven Publishers. Philadelphia, PA. 1998. pp 241-250. Keen MS, Khosh MM: The Role of Botulinum A Toxin in Facial Plastic Surgery. In Facial Plastic Surgery . Willet, JM (ed.) Appleton and Lang Inc. Philadelphia, PA. 1997. pp 323-329. Khosh MM, Aviv JE: Complications of Surgery, In Essentials of Head and Neck Oncology. Close LG, Larson DL, and Shah JP (eds.) Thieme Publishers, New York, NY. 1998. pp 385-394. Khosh MM: Frown Lines in the Glabellar Area. In Clinical Case Studies in Plastic Surgery. Keen MS (ed.) Greenwich Press, Greenwich, CT. 1996. pp 57-60. Krespi YP, Khosh MM: Laser Assisted Uvula Palatoplasty for Snoring. In Cosmetic Laser Surgery. Alster T (ed.) J. Wiley and Sons Inc. New York, NY. 1995. pp 67-80. Khosh MM: Unilateral Nasal Obstruction. In Clinical Pearls and Pitfalls in otolaryngology. Close LG (ed.) Greenwich Publishing Co. Greenwich, CT. 1995.